Stunning skin rarely happens naturally — achieving a radiant complexion means you’ll likely have to take care of your pores. One great way to do that is with a sugar scrub. Thanks to the small particles and humectant properties of sugar, it’s a naturally hydrating exfoliator that can remove dead surface cells to unveil a stunning, healthy look underneath. Even better, because sugar is an everyday grocery item, there’s no reason you can’t make a DIY scrub at home. Here’s a look at the benefits of this beauty concoction, how to make it, and where to use it on your body. While many mainstream exfoliators can be harsh and overly abrasive, sugar scrubs are gentle enough to remove dry, dead skin cells without causing irritation. They support cell turnover, encourage smooth and soft skin, and may even help your other grooming products work more effectively. 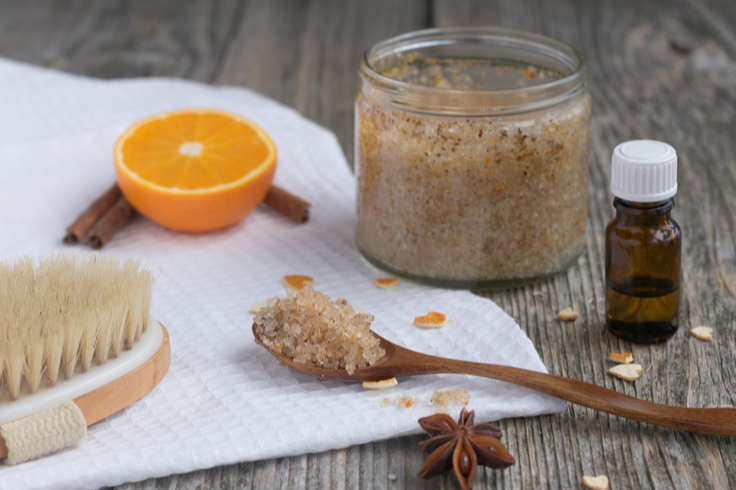 It’s easy to make a DIY sugar scrub at home with a few basic ingredients. In a small bowl, mix sugar, honey and a few drops of essential oil. Then, gently massage this mixture onto your face in circular motions. Another option is sugar with olive oil and a few drops of essential oil. You could even add the antioxidants of green tea to your scrub by making a blend of green tea leaves, brewed green tea, sugar and grapeseed oil. Whatever combination you use, brown sugar is ideal for facial sugar scrubs — as it’s softer and less abrasive than granulated sugar or raw/turbinado sugar. Traditional sugar can work well in scrubs for the rest of the body and especially in rougher areas such as elbows or feet. The beauty of exfoliation is in how it sloughs away dead skin, priming your complexion for toners, moisturizers and other items in your grooming routine. You only need to use a topical sugar scrub twice a week to reap its benefits; in fact, using one more than three times a week can be harmful. Face: Unblock pores, remove dead skin cells, and unveil a better complexion by using a sugar scrub on your face. Lips: Gently exfoliate, plump and soften lips with a sugar scrub that buffs away dead and dry cells around your mouth. Body: Sugar scrubs offer benefits to all of the body — including arms, hands, legs, feet, torso, etc. By removing dead skin, you can soften dry skin and enjoy a smoother, refreshed body in the process. If you’ve been thinking about trying a DIY sugar scrub and wondering how, now’s the perfect time to start. Use the information above to create your scrub and enjoy an at-home spa treatment made with ingredients you may already have on hand.